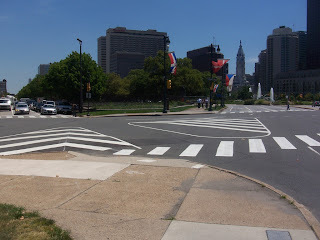 On July 1st, we provided an update on the new "streetscaping" project on the Ben Franklin Parkway and how it was moving the bike lanes from the inner roadways to the outer roadways. 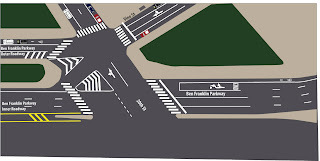 30 days later (and several weeks of heat waves,) we wanted to let you that we worked to find a solution to the difficult transition from the Parkway on Logan Square across 20th Street over to the inner roadway of the Parkway. We met with the Department of Parks and Recreation, the Streets Department and the Mayor's Office of Transportation to discuss possible solutions. The current situation and two variations of the same solution is depicted in the following three images. 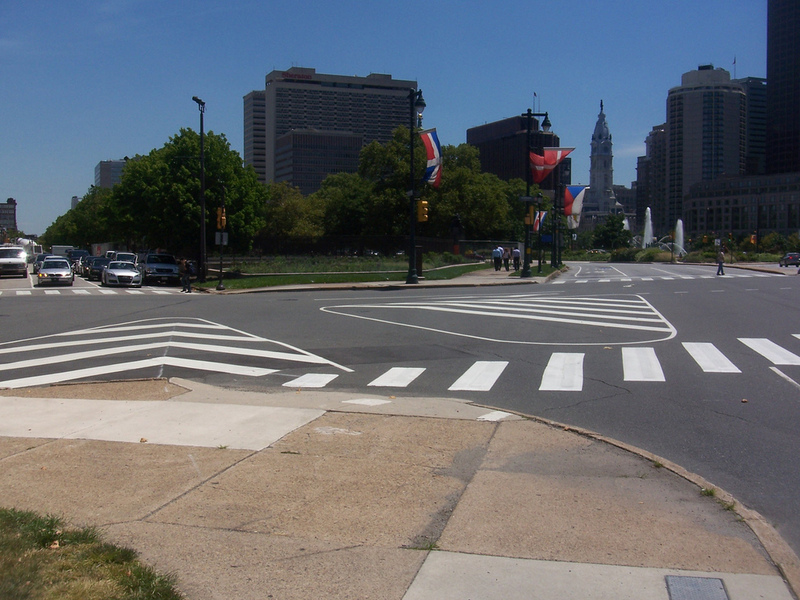 Current 20th and Ben Franklin Parkway Intersection Configuration. Parking is still permitted in the newly painted bike lane on the outer roadway. Note in the proposals that the intersection of 20th and Vine contains a special "two stage left turn" bike box which is also known as a "Copenhagen-left". City staff from all three agencies who met with us liked the proposed solution (and slight variation of a bike box) and we were told that it will be executed between now and around Labor Day when the final stage of the construction project (the inner roadway between 20th and 21st) finishes up. Wait a minute... 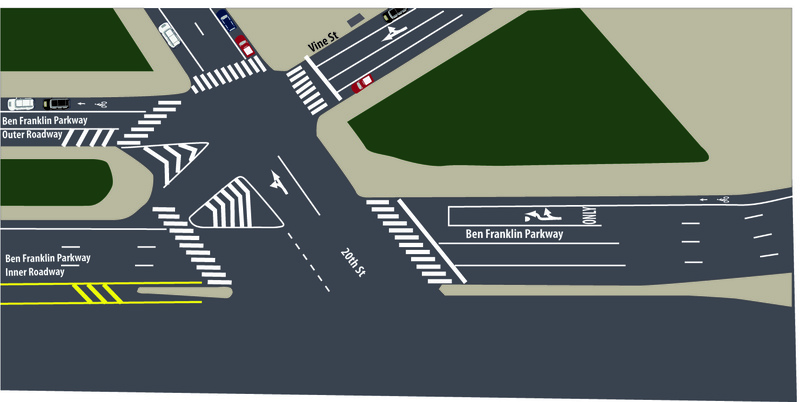 I'm gonna stay in the auto traffic turn lane and flow ahead and then beside cars (on their right) as they make the transition from Logan Square to the outer lane of the Parkway. If I stay with the cars and track as a moving vehicle, will I be ticketed if I make that transition without keeping in the marked bike lanes? If I arrive late to the green light (on my bike) and there are lots of cars making that right turn onto 20th, then I'll consider using the Copenhagen left. 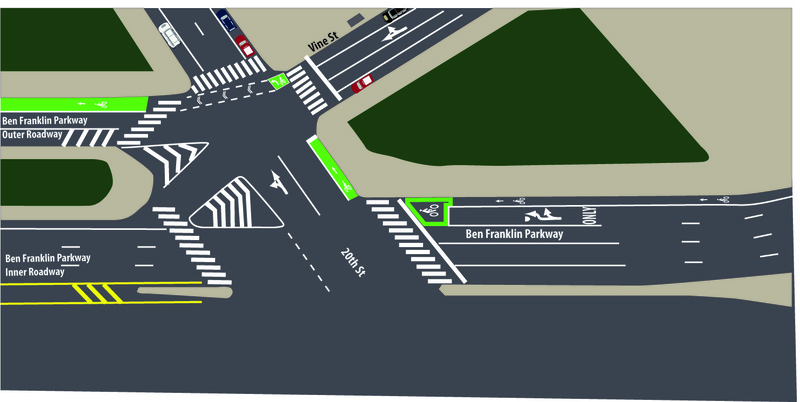 If I'm in the bike box and no taxi is crowding me out, when that light changes I'm staying with traffic flow. This proposal was designed for less experienced cyclists and the expectation is that more experienced cyclists will move with traffic. It's highly unlikely that you will be ticketed for making a legal maneuver. If a ticket is issued, State Law, which permits cyclists to ride with traffic, trumps local civic code. I like the later 2 proposals. The first had me really concerned that cyclists could get the right-hook. What I also like is that cyclists have the option of maneuvering through the intersection in a vehicular fashion if they so choose. Now if agencies in New Jersey could just start by build a bicycle lanes of the standard minimum width of 5 feet. Anything this complicated is WAY beyond them.